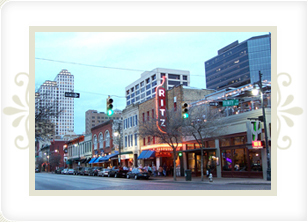 TexasOutside.com - A great site to visit to find fun things to see and do in Austin. You'll find free information on boating, biking, golfing, camping, disc golf, fishing, and lots more. The University of Texas at Austin started with a single Victorian Gothic-style building in 1883. Today, it's one of the country's largest public universities, with nearly 50,000 students regularly navigating its 350-acre campus. Walking tours take visitors past graceful live oaks and limestone buildings with red tile roofs. Following a 23-year closure, the observation deck of the school's landmark tower also is accessible via guided tour. Several museums foster the analytical ideals of the university. Exhibits at the Texas Natural Science Center focus on biology, geology and paleontology and include mounted wildlife specimens, a 925-carat blue topaz crystal and the bones of a 30-foot-long prehistoric seagoing lizard. In the working laboratory, visitors interact with scientists diligently preparing, cataloguing and studying fossils. Also on campus is the Lyndon Baines Johnson Library and Museum. Its extensive collection of exhibits and historical documents depict the life of the nation's 36th president. This AAA GEM attraction showcases an animatronic version of LBJ, more than 4,000 original editorial cartoons related to Johnson's political career, a photographic overview of the White House interior and a 7/8-scale replica of the Oval Office. The First Lady's Gallery pays tribute to Lady Bird Johnson, an alumna of the university. European Old Master paintings, American and Latin American art, and prints and drawings are displayed at The Blanton Museum of Art. Discover the technique favored by Peter Paul Rubens and other 17th-century painters; investigate Uruguayan artist Julio Alpuy's Universal Constructivism style; and survey Richard Long's “Summer Circle,” a 29.5-foot-wide sculpture formed out of Delabole slate. Just across the street, The Bob Bullock Texas State History Museum houses interactive exhibits and more than 700 artifacts beneath its copper dome. Such displays as a wooden oil rig, salvage from a 17th-century shipwreck and a lunar lander model are offered at this attraction. From a special effects-laden show highlighting local stories of perseverance to a presentation about the Texas Revolution, a range of multimedia illustrates the region's sweeping past. Referencing the pen name of writer William Sydney Porter, the O. Henry Museum commemorates “the master of the short story.” From 1893 to 1895, the author known for his signature twist endings lived in this Queen Anne-style cottage, which now houses O. Henry memorabilia. Porter, an Austin resident for more than a decade, likely used his experiences in Texas as fodder for his prose. Ney also created monuments found in Texas State Cemetery. The state's honored dead are interred there, including Stephen F. Austin, the “Father of Texas,” and Gen. Albert Sidney Johnston, a hero in the Texas War for Independence. A limestone visitor center presents the history of the burial ground. The meticulously maintained facility also features striking memorials to Texan Medal of Honor recipients and the victims of Sept. 11. “Sunset red” granite, round decorative skylights and original wainscoting distinguish the Renaissance Revival-style Texas State Capitol. Atop the domed, 19th-century edifice, a goddess keeps watch over the city—the statue represents Athena, the Greek deity of wisdom and warfare. Seventeen other figures, including a miniature Statue of Liberty and a bronze monument honoring Texas' pioneer women, grace the nearly 22-acres of shady, landscaped grounds. Thirty-two years older than the Capitol, the Governor's Mansion features buff-colored bricks produced from a Colorado River clay pit. Six fluted Ionic columns line the front of the Greek Revival-style structure, while portraits of notable Texans, including Stephen F. Austin and Davy Crockett, are inside. An assortment of heirlooms and original furniture, such as the mahogany bed in which two of Gov. Sam Houston's children were born, relate the lives of past inhabitants. Two separate locations focus on modern and contemporary works. 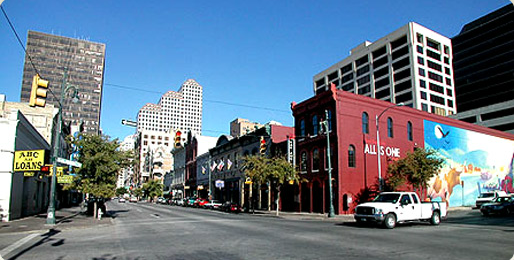 Austin Museum of Art–Downtown, the main exhibition space, opened in 1996 and showcases paintings, sculptures, drawings, photographs and prints. Austin Museum of Art–Laguna Gloria, the original home of the museum, presents changing displays in a natural setting overlooking Lake Austin. This historic 12-acre estate consists of a 1916 Italiante-style villa, a sculpture garden and an art school. Umlauf Sculpture Garden & Museum displays drawings, paintings and carvings by Charles Umlauf, a University of Texas professor emeritus whose work appeared in both the Smithsonian Institution and the Metropolitan Museum of Art. Crisscrossed by gravel paths, the garden contains 56 statues, including a smaller version of the artist's “Spirit of Flight”; the actual 17-foot-tall monument marks the entrance to Dallas' Love Field Airport. Mexic-Arte Museum features contemporary and traditional works by Mexican, Latin American and U.S.-born Latino artists. Changing exhibits offering photography, paintings and sculpture highlight both established and emerging artists. A wide range of activities is available at Zilker Metropolitan Park, from leisurely strolls and picnics to more intense pastimes. Spirited yells abound on the sandy volleyball court, while giggles are constant passengers aboard the park's miniature train. Daring leaps into the natural, spring-fed pool stir sun-kissed waters, and dirt-splotched legs regularly sweep down soccer fields in pursuit of checkered spheres. As night falls, diverse singers croon at an amphitheater surrounded by pecan trees. On the western edge of the park, visitors to the Austin Nature & Science Center gaze at the large, spotted owl perched above; the creature's round, puffy head twists casually as its dark brown eyes scan the fascinated crowd. More than 90 native animals are exhibited at the center, while hands-on activities convey information about amphibians, birds, mammals, minerals, plants, reptiles and rocks. The centerpiece of the park is Zilker Botanical Gardens, harboring native, hybrid and exotic vegetation. On site are butterfly, herb and rose gardens as well as a center with educational displays. A 2-acre plot features re-creations of plants that existed during the time of the dinosaurs. Serene ponds in the Isamu Taniguchi Oriental Garden spell out “AUSTIN,” and a Japanese teahouse provides breathtaking views of the city. The goal of the Lady Bird Johnson Wildflower Center is to protect and preserve North America's native plants and natural terrain through landscape restoration, plant conservation, and educational and horticultural programs. Sixteen gardens shelter such flora as evening primrose, purple coneflowers and Lindheimer daisies. Several walking trails invite exploration, including a 1-mile interpretive path educating visitors about land management.